Uddhava feared as much. Being a pandit of many scriptures, including ayurveda, Uddhava knew it was really over. His chariot went over a rock that disturbed his thoughts. Today the charioteer was also nervous, everyone was. The entire clan, every male in the Yadav clan was dead? There were no survivors, none at all. No children, all were dead, leaving behind a hoard of weeping and crying elders. What could have cause for this blood bath? The roads to Vrindavan were familiar, Krishan always gave him news to pass on to his birth village. Uddhava was known as the bearer of bad news. Last time he was here, he told them about Krishna would never return to Vrindavan. So many people hated him for that, don't shoot the messenger, he pleaded. Today’s news was even worst. How would they react? The noble people of Vrindavan? The chariot was the same that carried Krishna away from Vrindavan and it was only fair it should be used to end the final chapter. The noble gates of Vrindavan were always open for every stranger. This pleasant village had to warriors only honest farmers and milkmen. He stopped the chariot at the banks of River Yamuna. This was the place were Krishna had defeated the giant snake Kalia. He washed his face in the holy water once. How would he break the bad news? He was the learned scholar of all the Vedas? A splash of water disturbed his thoughts, he looked ahead to see Radha sitting at the banks of River Yamuna. Radha used to visit the banks of Yamuna to feed the goose everytime she came home to her mailka, the home of her parents. 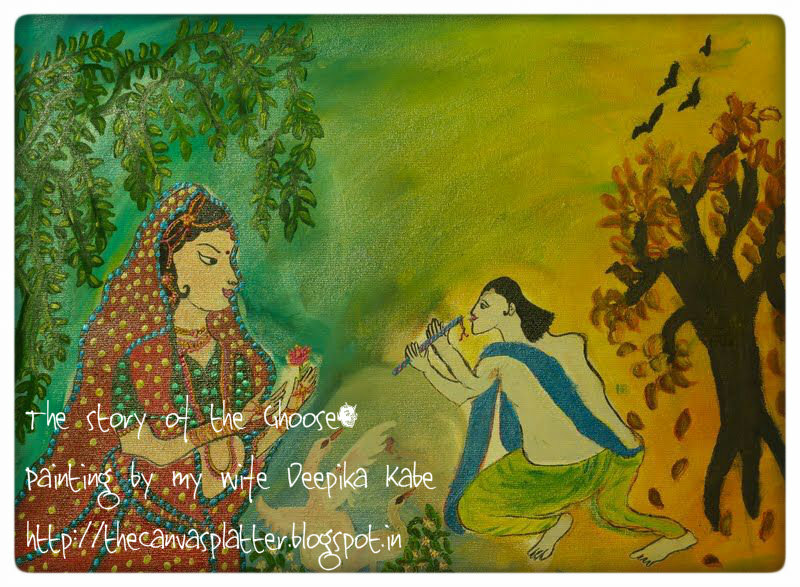 This was a ritual that was set by Krishna who had passed on the baton to her. She looked at Uddhava and smiled, "What more bad news you bring, Uddava?" she asked simply. His lips froze, unable to speak. The entire vocabulary vanished from his head. He looked into her eyes and mumbled something that made no sense even to him. "He is dead isn’t he?" she asked simply without even pausing to look in his eyes and busy feeding the goose in the river. "How do…," he mumbled and then paused, she was Krishna’s soul mate and they both were bound by a connection that wasn't merely physical, "Yes," he said finally bursting in tears. All the emotions bottled up in his mind flooded out of the crevasse. His legs gave way and he collapsed on the ground. "Do not mourn over the dead, Uddhava," Radha said consoling him, "We all die, eventually. Krishna taught me one thing, life moves on. Kalia, the giant snake was too attached to his abode at the bottom of this river. Krishna humbled him to move on. Krishna always used to tell me to be like the goose in these waters. They enjoy the water, but never let the water touch its feathers." Uddhava looked in her eyes, they were sad but had no tears, how could she not cry? She was the soul-mate of Krishna. But her eyes told a different story, they were the same like Krishna. Krishna had left the world physically, but He was with her right now. "When Krishna left vrindavan in the chariot, we met at the same river bank," Radha explained futher, "while leaving he asked me to feed his goose while he was away. I never understood what he was trying to tell me, but finally a few days ago I realized, what he really meant was. He was never going to come back physically; he wanted me to detach myself from his physical sense, so that we can be immortal together forever. I knew when you will return again with another news it would be of his death and I had prepared myself for it," she smiled. Now Uddhava understood why his friend had send him here. This time Uddhava was not the messenger, Radha was. The final piece of puzzle that Krishna had left for him. Krishna was never attached to physical things or places. He had moved from Vrindavan to Mathura and then from Mathura to Dwarka. His true realm was himself, not the cities; his Vaikunth was with Krishna all along. Just like Krishna, life also changes moves, nothing is constant. That is why Krishna never tried to save the Yadavas, because Krishna knew, the time had finally come. Similarly the yuga also would change, a new yuga would come to eradicate the old one. A new generation will come to mow over the older one, that is the cycle of life. There was nothing constant in the world, there was nothing to keep attached. He finally knew was going to happen next. They will rebuild Dwarka again, brick by brick. Raise the city back from the dead. "You know what that means now, don’t you?" Uddhava finally stood up, wiped his tears and handed the broken flute to Radha, "Great perils lay ahead for it is the beginning of Kalyuga." 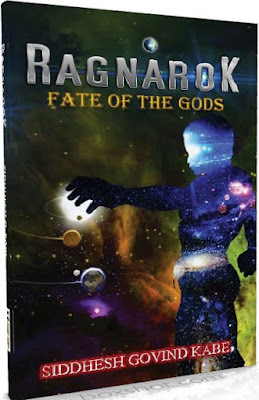 The story is based on Hamsa Gita, the song of the goose, the final chapter of Bhagwat Purana. I have taken poetic liberties to visualize the final scene in Dwapar Yuga. The Gregorian calender date for the event was 18 February 3102 BCE. The story and the setup is fictional, the message is from Bhagwat Purana. I am liking these retellings.